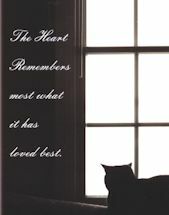 The front of this cat sympathy card says "The Heart Remembers most what it has loved best". Inside message: "May special memories bring you comfort". The card is 6 3/4" high x 4 3/4" wide. Envelope included.